The transition between summer and fall was exceptionally rapid this year. After months of hot, dry weather, a cold front rolled in and brought temperatures below ten degrees and a deluge of rain that seemed to last for weeks. Even my five-year-old son noticed the change: “Dad, is it fall now?” Apparently so. For me, the seasonal transition marks a time to reflect on my summer of accomplishments and disappointments, and to set new goals! New goals give me something to look forward to during the upcoming winter and help me plan out the next summer (I’ve already planned more than twenty days of trips for summer 2019). Between Phil and me, we have a lengthy list of multi-day adventures that we have been putting off, and this is the year to do them. Phil on the summit ridge– it looks far! Part of the planning for these trips is observing the inspiration that comes from reviewing the accomplishments of my online friends, via social media feeds. This summer, the algorithms inundated me with many stories about canyoneering. But, because I’m still only halfway through my Island Alpine Quest –a massive list of peaks– I didn’t dare dream too deeply, because I am committed to my current obsession. 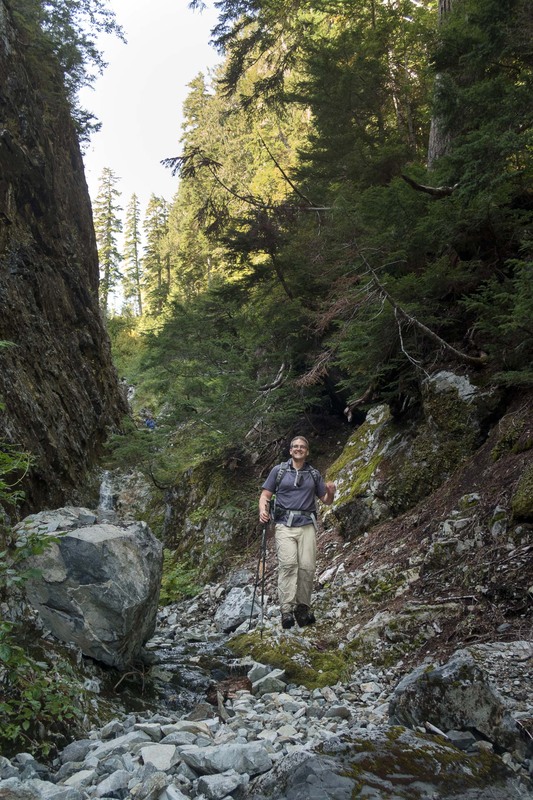 Perhaps this is why I never imagined finding myself in a steep-walled canyon, and I certainly never expected that experience to come on the descent of Mount Leighton, but that’s precisely what happened. It was only four degrees by the time we reached our parking spot (400m) on September 23rd. 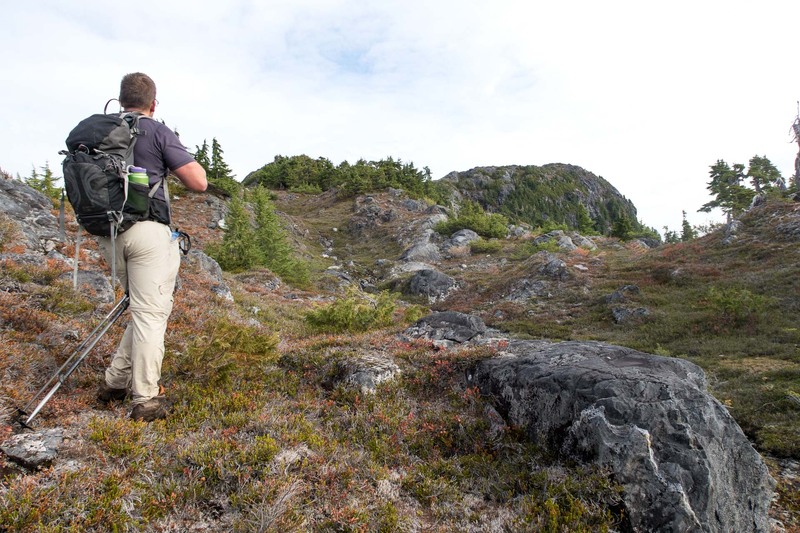 We left Nanaimo extra early to arrive at Leighton Peak by 8:00 am, ensuring that we could maximize the hours of daylight during the ever-shortening days of fall. 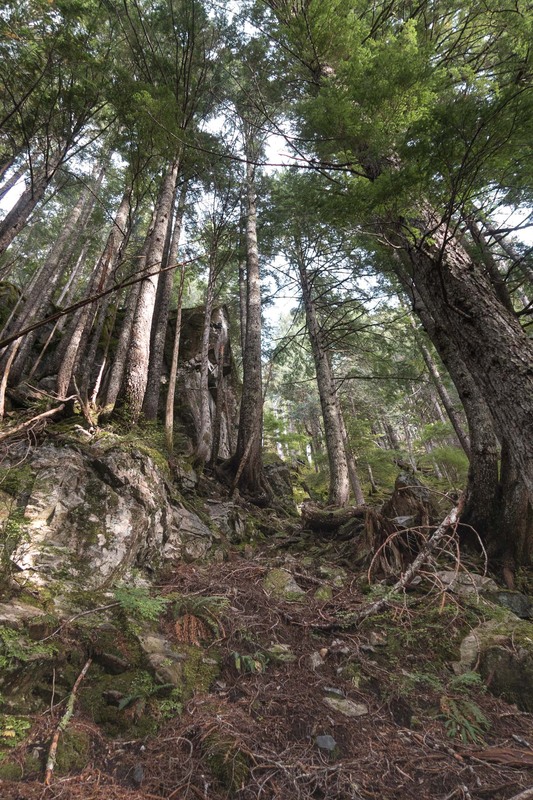 I’m happy we left early, because upon arrival we discovered that the logging spur we hoped to drive was overgrown. 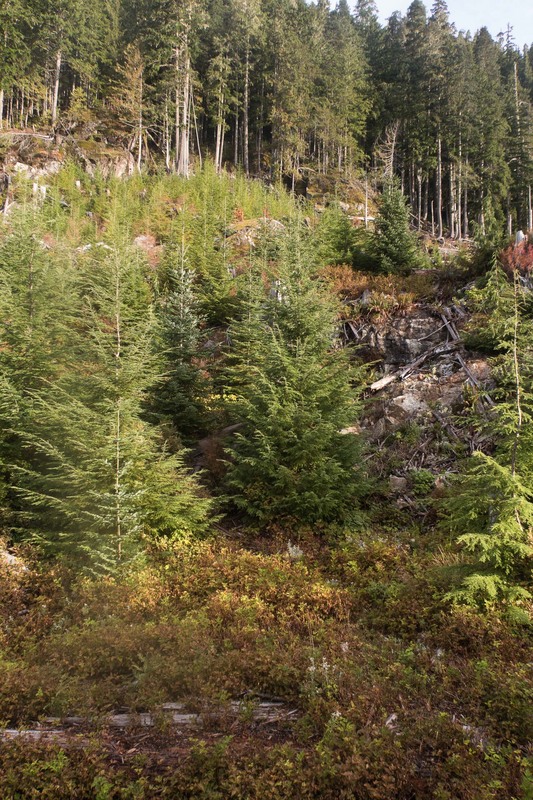 This added an extra five kilometres of logging road and 300 metres of elevation to our trip– we needed all the light we could get! The route is complicated; however, the summit ridge is one of the most beautiful alpine ridges I hiked this year. Providing a great description that offers reliable instruction is nearly hopeless. To summarize Elms’ write up in the Island Bushwhacker, You can find your way through the series of bluffs. It goes, that’s for sure, but the fun is in figuring out how, and how exposed you are willing to get while doing it. We quickly made our way up the switchbacks to the end of the road (~700m). The cool morning air meant the alder was laden with water, and by the time we reached the end of the road we were all damp from pushing against the bush. 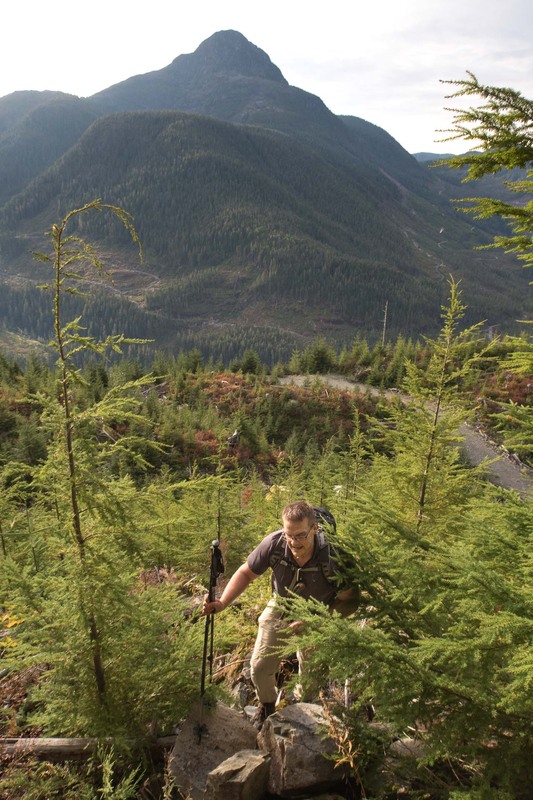 We took the most straightforward route we could find through a short section of logging slash before scrambling up into the steep old-growth. We read the Bushwhacker report, but we still had hopes for a mostly open forest, and we wondered about the bluffs. After scrambling up a series of moss-covered gullies, we found the answer to both questions: tall. 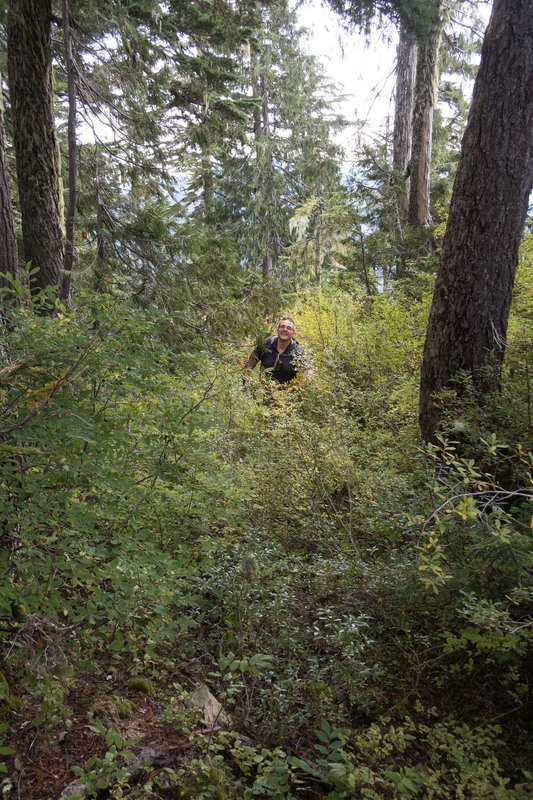 Pushing through the bush was a feat unto itself; even Phil agreed that it was at least B3. At times, it took sheer brute force to push through the crisscrossed tangle of shrubs. The bluffs were another story. Elms is right: there are ways to get beyond them. It took some searching, but we were able to find a route through. At some points the bluffs top more than forty feet, but in most cases, we found easier scrambles or even some Class 2 routes with searching. However, there was one section that challenged everyone. 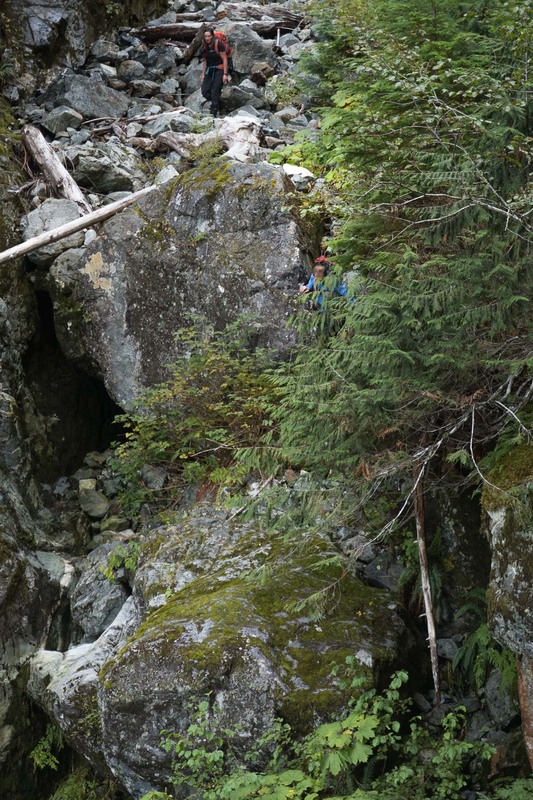 After rowing through an extraordinarily high patch of blueberry –still laden with giant alpine blueberries and highbush huckleberry– the most accessible portal we could find was a very wet and mossy climb up through a narrow gully. It took mantling, laybacks, some wedging against the drenched moss, and use of old dead trees to make our way up the four metres to the next level above –low fifth class. It’s doubtful the route further to the west is any more accessible, and I’m unsure about the east; but the fact that there were still berries left unpicked by bears makes me think this level is challenging to access. Even beyond the most challenging of bluffs, there is more bush. Then, once we were on the toe of the ridge, right up to about 1300 metres, we fought with azalea. Only when we broke onto the summit ridge could we see the summit of Leighton Peak. A few lakes– no big deal. 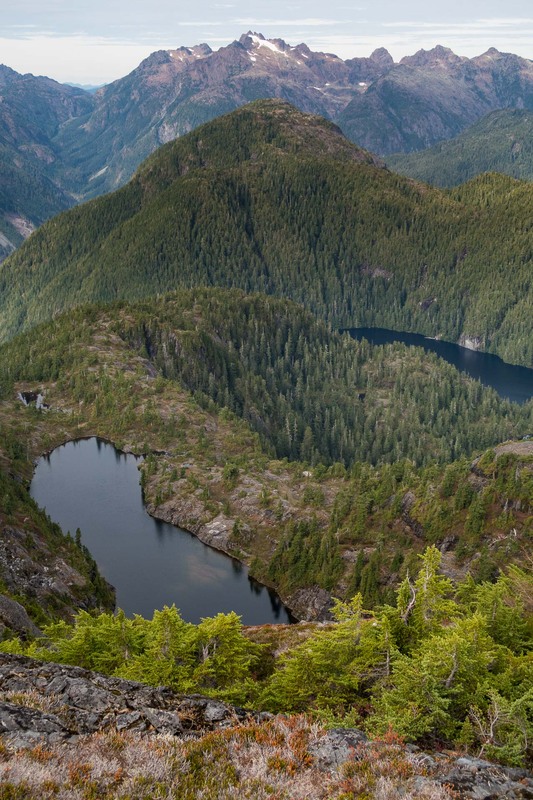 The summit is unremarkable, but the stroll along the open ridge offers excellent views of high island alpine lakes and distant vistas. We picked out many of the grand features on the Island– Colonel Foster, Victoria Peak, Kings, Rambler, Rugged, Yai’ai– and a dozen lesser peaks that are still on our to-do list. The view down the Norgate Creek Valley across to Conuma Peak left me with mixed feelings –the valley is riddled with logging roads. We ate our lunch on the breezy summit and talked about finding an alternate route back to the car, since no one was keen to descend the mossy gully. 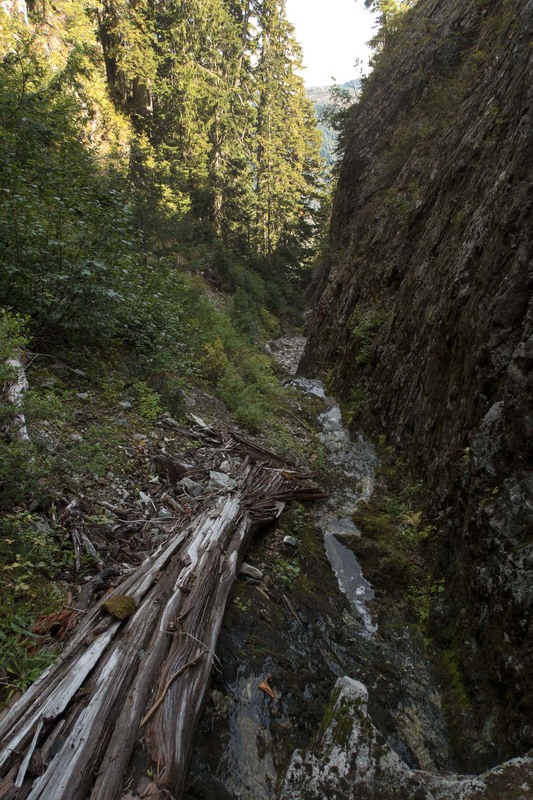 Our desire to avoid this led to the highlight of the trip: an epic canyon descent back to the logging road. After leaving the summit and diving back into the bush, we followed our ascent route back to the shoulder of the ridge (~1120m) and down to the next level. We lowered ourselves down and turned eastward, keeping to a hollow in the terrain that eventually became a dry watercourse. Here we were faced with the option of staying high to follow the ridge crest or hopping down into the gully. 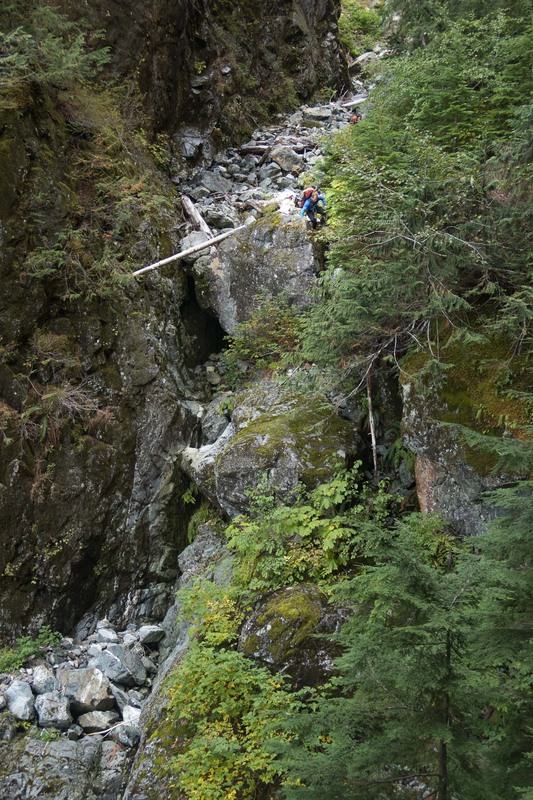 We had no beta on either of these options, but we picked the gully–into the ravine! We had no idea what we were getting ourselves into. It started like many other rock-filled gullies we’ve encountered, but it was soon clear that we were descending a seasonal watercourse. Just twelve inches wide at the top, all the soil was washed away, exposing the sharply jagged rock bottom. The lower we descended, the wider it became, and more pronounced the evidence that a torrent of water rushes down the gully. The rocky route was a juxtaposition of textures. Though the bottom of the watercourse was jagged and nearly free of any small rocks, several large boulders were polished round. Fortunately, the stones had a rough texture that offered excellent grip, though they wore off my fingerprints and the top layer of skin on the heel of my hand. It was a long slow descent into madness. The lower we descended, the higher the rock wall on our right rose, and the narrower the bank to the left became –eventually it too would dwindle to nothing but a rock wall. A feeling of foreboding began to loom, almost dread. Would the route go, or would we be faced with a long ascent back to the ridge, forced to descend via our ascent route? By the time the walls rose more than sixty feet above our heads, I was committed to making the route work. Where we didn’t want to lower ourselves down rocks, we deked into the small strip of the bush to the left and fought through salmonberry, hemlock, and some patches of devil’s club. It was all going so well until we reached 720 metres. From high above, water ran down the rock face and formed a watercourse that merged with the canyon. But only a few meters away, it rushed off a twenty-foot waterfall to a pool below. There was no way we would make it down. I was defeated. I really thought we were going to regain the 300 metres we just dropped. Phil to the rescue! He caught a glimpse of a possible route leading to the forest above, on the left. It was steep soil and trees; about the only course off the left of the gully, we found. He gave it a test, and after dislodging a boulder and saving himself from a fall into the rushing water by hanging onto the overhanging branches, he headed to the forest above. This route must be frequented by animals, because there was a very pronounced game trail leading out of the canyon and away from the edge. From here we followed the steep (40 degrees at times) forested slopes down and scrambled down to the watercourse at 620 metres. 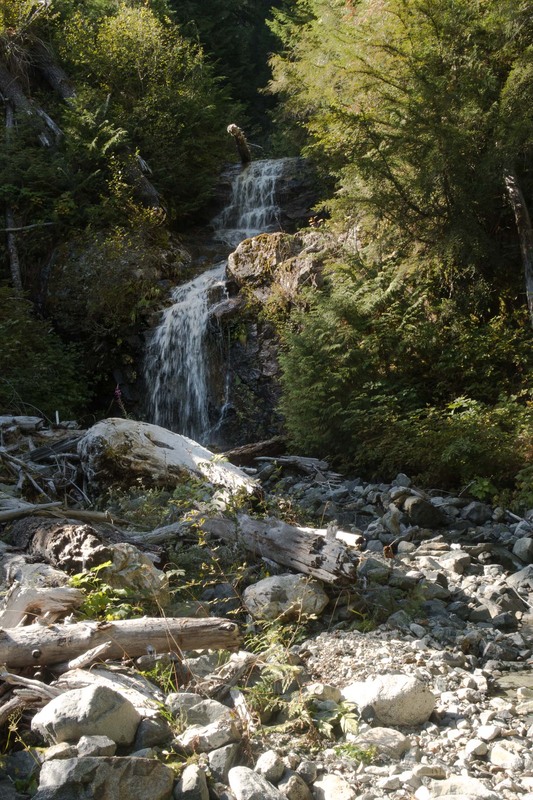 Sun fell on the watercourse and illuminated a waterfall that fed a reflecting pool at the exit from the bush. Once everyone was together, we walked along a log that stepped out onto the logging road. Well, okay, there was about six feet of salmonberries to walk through, but the road was right there! If you’re into type 2 fun, then I highly recommend a trip to Leighton Peak. 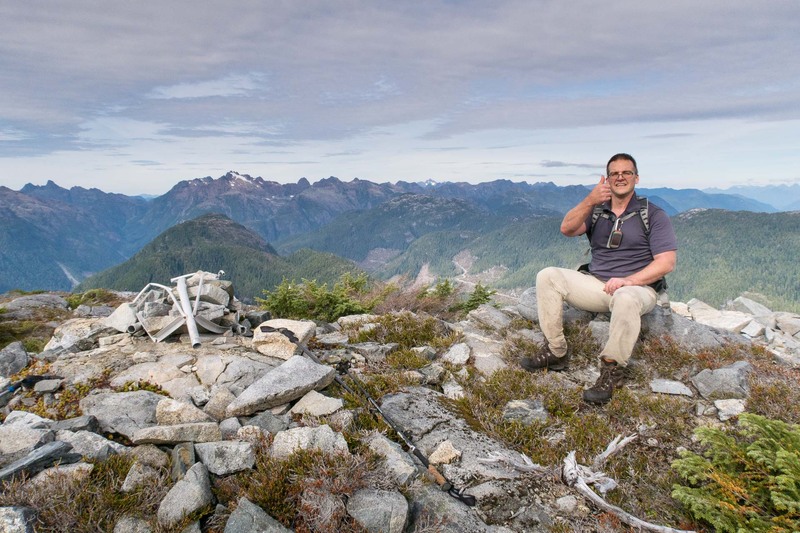 But if your idea of good fun is hiking the extensive open alpine of Strathcona Park, then I recommend staying as far away from Leighton Peak as you can– it’s no good for you here. Elms, Lindsay. 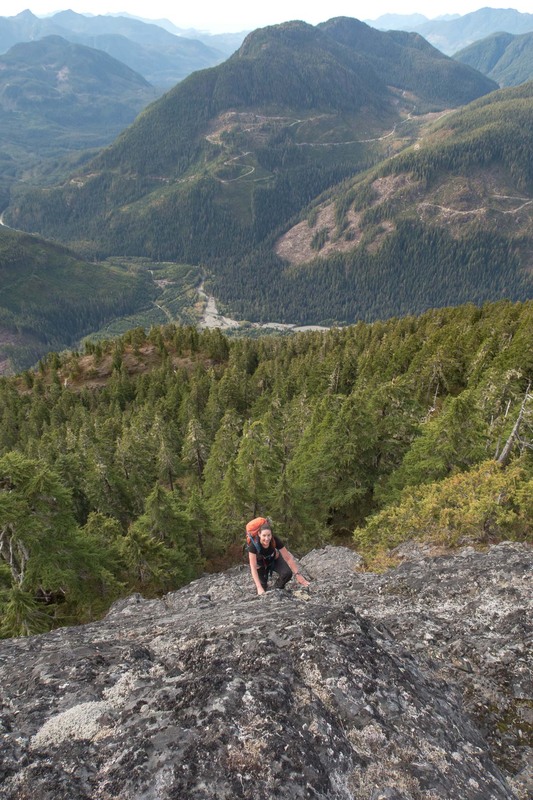 “accvi_iba_2006.Pdf.” Alpine Club of Canada Vancouver Island Section. Stone, Philip. 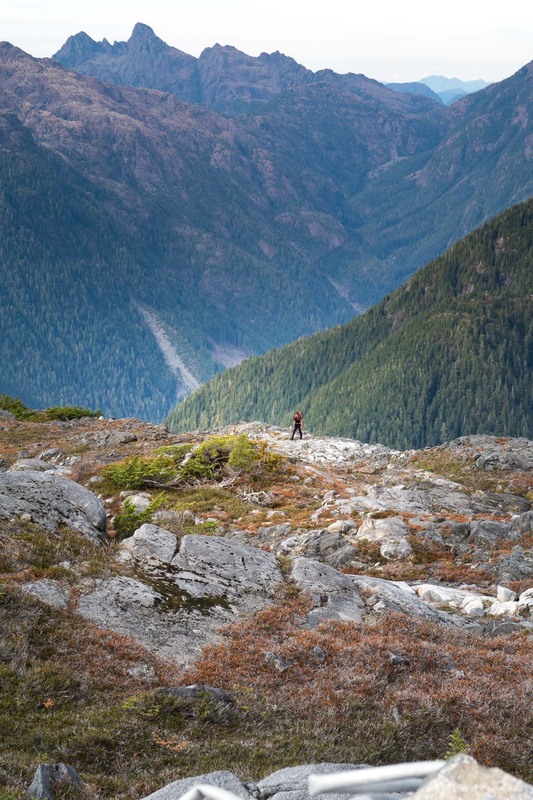 Island Alpine: a Guide to the Mountains of Strathcona Park and Vancouver Island. Wild Isle Publications, 2003.